This book is set in a world where a random star shows up in the night sky. And this star gives off these bizarre powers that turn ordinary people into Epics. At least that's the theory. This world is suddenly possible for a Superman to emerge, but instead, we get brutal, powerful men wanting more power. And it turns the world ugly really quickly. In Newcago, David has grown up an orphan. He remembers a time before Steelheart's reign, a time when there was still sun light. But it's all gone now. And he wants revenge. 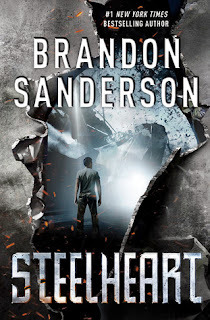 He wants to kill Steelheart. But the only way to do that is to get in league with a band of people who make it a hobby of killing Epics: the Reckoners. Honestly, I thought this book had a great concept. But David as a person annoyed the crap out of me. His really stupid metaphors, his incomplete thought process; I felt like it was an eight year old in a teenager's body. And then the bits of attempted romance just made me roll my eyes. I guess this book looked really good, but it rubbed me the wrong way. However, there are plenty of plot twists to keep you interested. I missed one major one, and it could have been redeeming enough to recommend this to others. oh no.. i can't stand books that induce eye rolls and with male protagonists that don't act their age.. I've bee interested in this book but i didn't know it was a male POV (i prefer female..) and a bad romance is a no no for me.